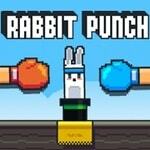 Beat rabbits boxing gloves which will be put out from a hat. It is necessary to put большее quantity of blows, than your contender. At game there is a mode for two players!